I knew what was wrong with the A-727. The reverse servo piston had cracked. The Shimniok daddy-daughter Moab trip was coming up at the end of March. I just had to get my rig back on the road and fast! Unlike the stock, cast material, billet aluminum isn't prone to cracking, making them popular among the Mopar drag race crowd who also prefer 1-piece servos without the stock inner spring that cushions reverse engagement. But surprise! The Jeep isn't a dragster. Fortunately, Randy J (mrrandyj) sells both 1- and 2-piece piston kits for 727. He's a good guy, easy to work with, and happy to share his considerable knowledge. Real engineering, the kind that takes obsessive dedication and doesn't fit in a sound bite or ad slogan, is what Randy put into his awesome products. The kit includes the piston, a new piston spring, and a beefy spring retainer, eliminating all the common reverse servo issues. You reuse the stock pin and inner spring. 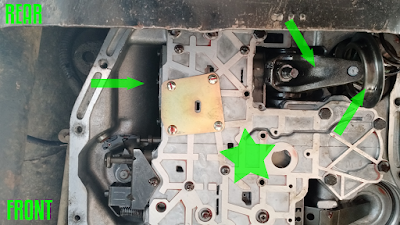 In the upper right is the reverse servo arm and piston/bore (two arrows), the retaining clip has been removed and the spring retainer is dangling. The piston and spring won't come out without removing the strut between the servo arm and the reverse band. Loosen the reverse band adjustment lock nut and square screw on the servo arm. Then, insert a pry bar (upper left arrow), force the band against the drum while pushing the arm up as far as you can. The strut should fall out and lodge in your cornea (if you forgot safety goggles). 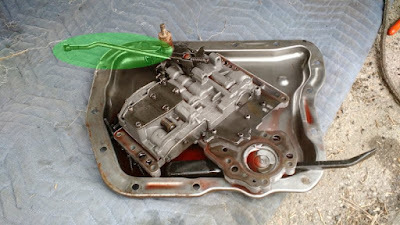 With some effort, the piston, spring, and retainer came out without removing the valve body (star), but it had to be removed to install the strut. Might as well drop it now. Don't panic. It's all self-contained and easy to get back in. No gaskets. Just bolts. Deep breath. 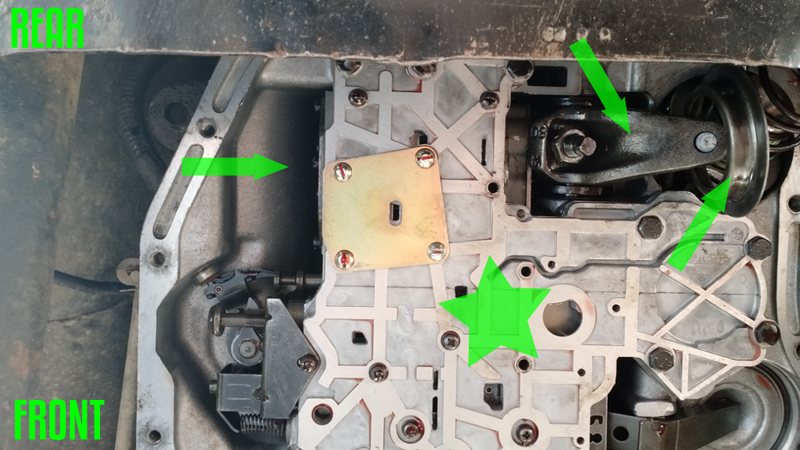 Disconnect the shift and throttle position linkage. The arms on these linkages are each indexed to a flat and clamped with a bolt and captured square nut. Remove the two linkage arms. Unplug the neutral safety switch plug. Valve body, all one self-contained chunk. Don't panic. Now remove the valve body bolts. The whole unit comes out along with the selector mechanism and attached parking rod (upper left above). The rod should easily disengage from the rear of the transmission case. Now, loosen the reverse band lock nut and square adjustment screw. Push the arm and piston far in, and pull out the strut or let it fall and lodge in your cornea if you forgot safety glasses. Spring retainer clip, top. Strut, bottom. The arm should now swing down free, providing enough clearance to slide out the piston and spring. 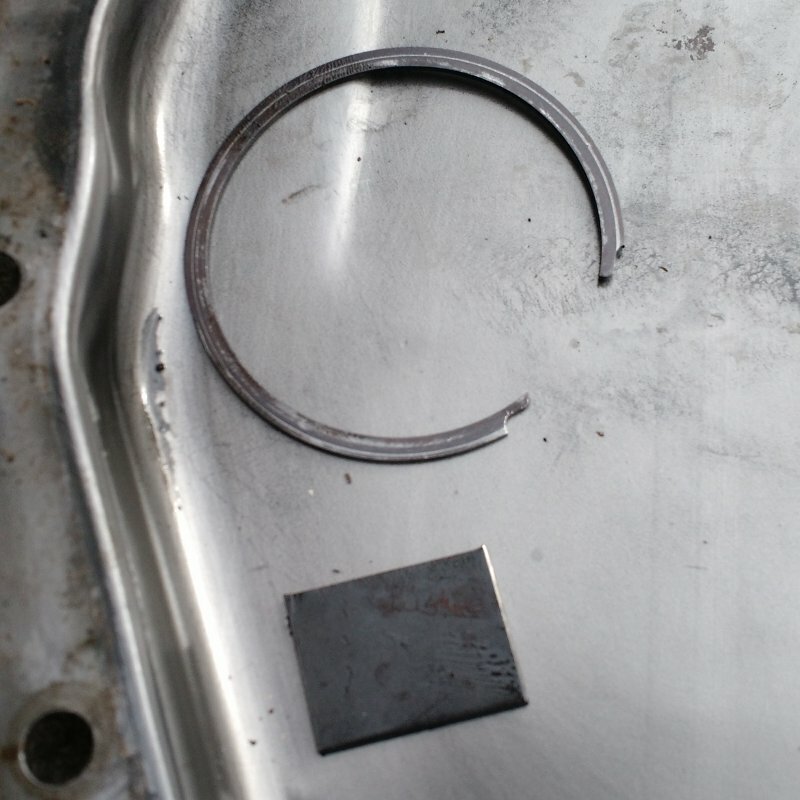 Remove the clip around the spring retainer, then remove the spring and piston. As you can see, I found where the missing chunk came from, in case there was any doubt. 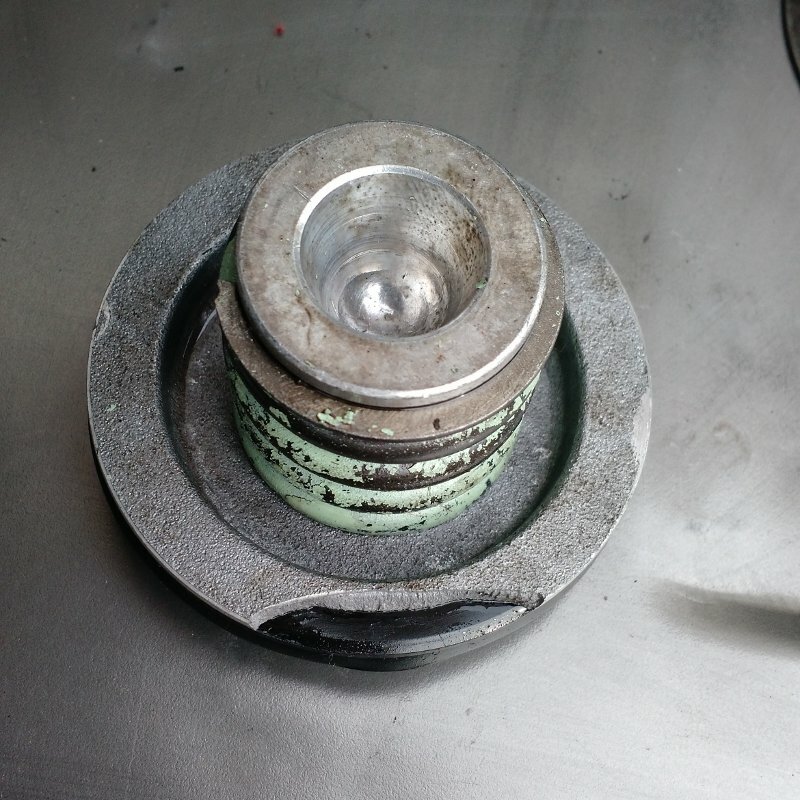 As mentioned, the stock piston is 2-piece. A pin in the center that the servo arm pushes, and a lower piston with rubber seal. An inner spring (painted light green above) cushions reverse engagement. I used a vise and a scrap of wood with a half-hole to press together the servo pin and piston so that I could remove the C clip holding the pin and piston together. Random scrap wood already had the perfect cutout. Next, install the new piston and reinstall the clip. Now it's time to put everything back together. 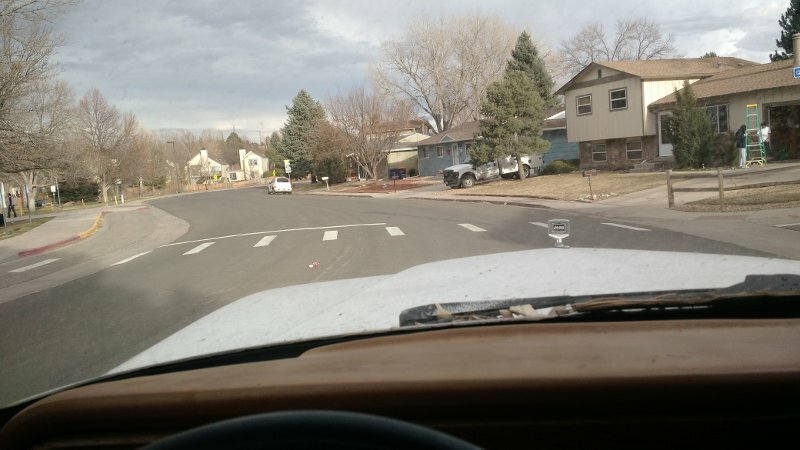 Lying on the cold, filthy curbside street, where you last left your dead truck, install the piston. Installing the spring, retainer, and retaining clip is tricky. Or maybe there's a special tool? I used a puller/installer tool and a socket to try and force the retainer in far enough to get the retaining clip in place. I'm sure this is easier when the transmission is out of the vehicle and upside down so gravity isn't working against you. Once that's in, install the strut much as you did before. 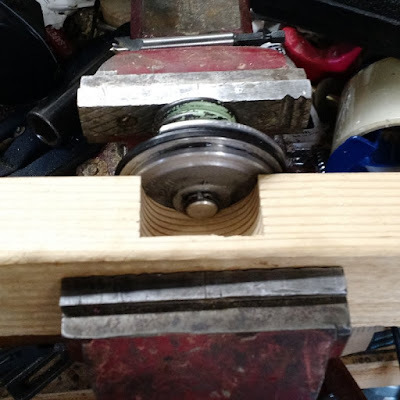 You can wedge a pry bar in to hold the band against the drum then use one hand to hold the strut and the other to move the servo arm, and snap the strut back in place. Might as well perform reverse band adjustment now in case the strut falls out again. You'll have to manipulate the valve body a little to get the park rod to engage at the rear of the case. It should pop in without much trouble. If not, make sure the selector is in park. You may need to chock wheels and put tcase in neutral and/or jack the rear wheels. The valve body slides back in like it came out, more or less, and you can hold it in with a couple of the bolts to start with, then torque them to specifications (careful; it's inch-pounds!). Now reinstall the linkage arms, tightening the clamping bolts. Reinstall the linkage. Install the new filter. Capture the gasket on the transmission pan with several bolts. Start threading them in and then tighten them to specifications (again, inch-pounds). I used a rubbery kind of gasket so no RTV for me. I also pounded the pan lip flat around the bolt holes. They often dent inward from over-tightening the pan bolts. My pan isn't leaking. Refill the transmission. Mine took about 6 quarts, but I started with, I think, 4 and worked up to 6, since overfilling is hard to undo. Look for leaks. Start vehicle, put in neutral awhile... check fluid level in neutral (wheels chocked) when warm. Add a little fluid at a time until it says you're full. Run the transmission through the gears several times, spending awhile in each gear letting the motor idle. This should make sure the various circuits get filled back up with fluid again. Hopefully you find that reverse works once again, and you can now jump for joy and high-five yourself. If your fluid is low, the transmission will slip and require higher rpms to engage. In that case, check fluid level and refill as above. After awhile you can test drive, make sure the transmission upshifts and downshifts properly in both D and manually selecting gears. Might as well check fluid level again and keep an eye on it and look for leaks over the next few days of driving. And that's it. Not so bad, was it?